Be prepared for the Black Friday onslaught as retailers, jittery about bagging Christmas trade sales, put the finishing touches to their promotions for the big discount day on Friday November 23. “I hate Black Friday, it’s everything bad about retail – it’s a con as so many of the products on offer are de-specified, but people see them as a bargain,” said Timothy Melgund, deputy chairman of Paperchase sharing his views of the US-import Black Friday at The Ladder Club last week (Wednesday 7 November). The design-led stationer is in fact participating in Black Friday, but will confine its promotional activity just to the actual Friday. “Last year we ran Black Friday promotions from Friday through to Sunday,” he explained. 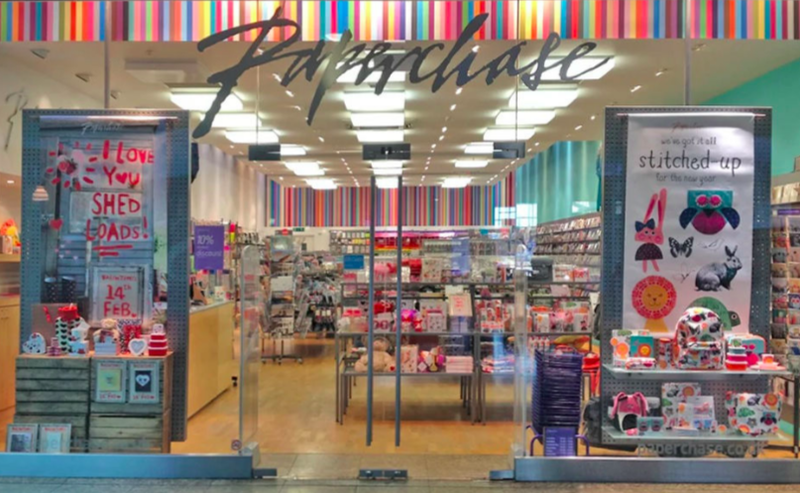 Above: Paperchase is only running promotions on the actual Black Friday this year. 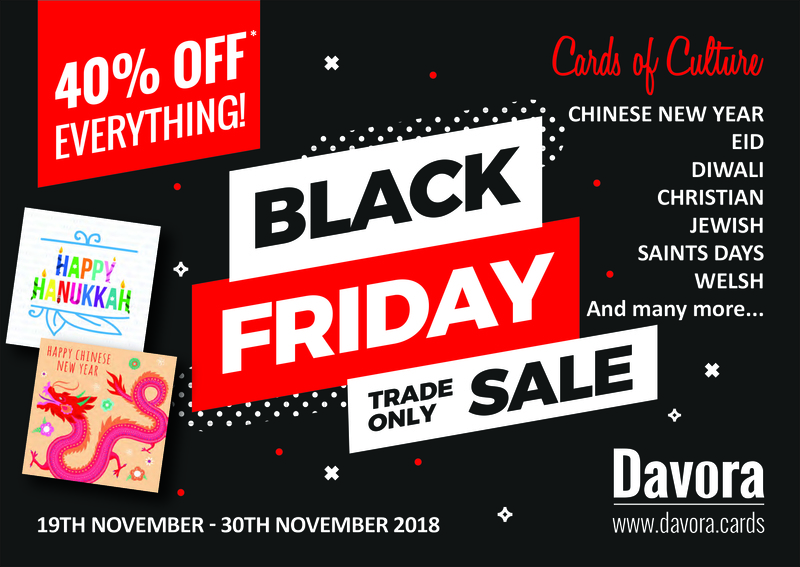 Greeting card publisher Davora is getting in the Black Friday spirit by launching a 40% off everything two week promotion for retail customers starting on Monday (November 19) and running through to Friday 30 November. “This is the first time we’ve ever instigated a Black Friday offer,” Raj Arora, managing director of Davora told PG Buzz. “For us it’s a way to get new customers to set up accounts and give our cards a try – and help us reduce some of our inventory to make room for new products next year,” he explained. Above: Davora is offering retailers a two week Black Friday promotion, starting on Monday. Black Friday is not the only retail event to be staged at retail next week as Just A Card’s Indie Week revs up to make its debut (November 19-23). Being flagged very much as “the independent alternative to Black Friday” by the grassroots campaign, founded by designer Sarah Hamilton. in the independent world!” she implores indies in correspondence to its thousands of supporters. Part of the activity is a ‘5 day Instagram Challenge’ which will encourage a different tack for social media activity every day during the week to promote independent retailers, makers and creators. 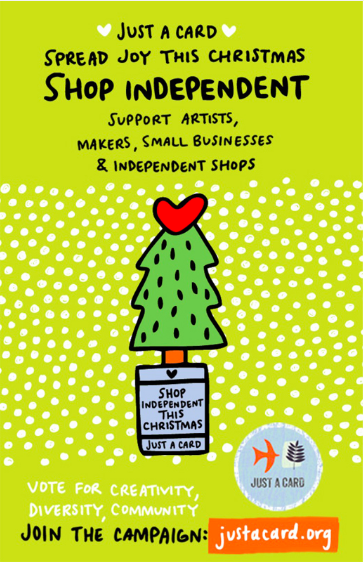 Above: Just A Card’s Indie Week kicks off next week to promote sales in independent shops for Christmas. 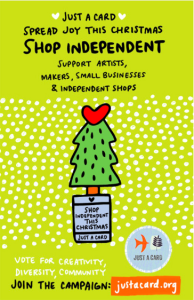 “Let’s work together to celebrate small businesses in the run up to Christmas – and remind everyone to shop independent this year,” inspires Sarah. With Just A Card window vinyls already on display in 3,000 independent stores and galleries (helped by support from the GCA, Cardgains, Top Drawer as well as individual publishers, including The Art File and Gemma) the campaign, which recently received backing from Funding Circle looks set to grow further. As part of its commitment to the campaign, and to add extra pep to Indie Week, Funding Circle is to run a competition for indies, being launched on Monday (November 23), the prize of which is £500 to be used to help market/promote an independent business. To be in with a chance, all you need to do is follow Funding Circle on Instagram where the competition will be launched. Top: Bricks and mortar retailers will have to shout loud against Amazon to cut through on Black Friday.